One of my all time favorite flies for a variety of situations is the Simi Seal Leech. This simply fly can be modified to look more like a nymph or left buggy to serve as a great leech pattern. And did I mention that it catches fish? Ah, the bluegill. I still have not found a good bluegill lake or pond here in Colorado, but trust me I'm starting to look. Back home, early season bluegill were a great way to pass the time in between trips to trout waters. Last year, I caught some big ones, including this one. Yes, you guessed it, this brute and many others were all caught on the Simi Seal Leech. It is my secret bluegill fly. Of course, bluegill will often eat just about anything, but this pattern seems to be particularly successful. 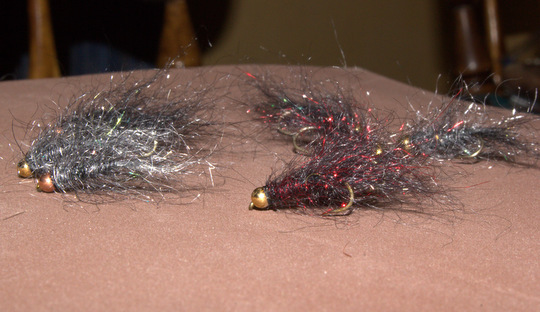 Recently, I sent an order for a half dozen of my Ultra Wire Soft Hackles to Bill over at Fishing Through Life. I tossed in an extra bead head Simi Seal Leech to aid him in his quest to catch 100 big bull bluegill this spring. It worked great, so good in fact that I just sent him another dozen with some new color schemes. The best thing about this pattern is that it is super fast to tie. I find myself caring less and less about a fly looking good and more and more about effectiveness and ease of tying. These flies just look buggy. If you are interested in trying this fly for yourself, you can purchase the material straight from the originator, John Rohmer. He has lots of other good materials that are also worth checking out. Personally, I use Black Simi Seal dubbing the most followed closely by Crystal although there are a LOT of other colors to check out. Try the dubbing on stonefly and other nymph patterns as well as for bodies on streamers. I'm hoping to add some big stillwater trout to the list of fish I've caught on this pattern now that I live in Colorado. The float tube is ready for spring and it will be time to hit the mountain lakes before we know it!!! I'll have to tie some of these. Like you I'm looking for simplicity and how easy it is to tie. Have you tried the dubbing form singlebarbed.biz? It's awesome. What size hook do you normally use? I can never tell from pics but I'm guessing a 10? Kevin, these are mostly #12 hooks with 3 (one of each color) #10. Those are my go-to sizes for bluegill. For trout, I'll fish these down to a #16 and simply avoid plucking a bunch of fibers out so it is more like a nymph but still with a great buggy look. Nice looking flies David. Boulder County is loaded with some decent waters for bluegill and a bass or two.